The petite specialist boutique Precis Petite is the leading store for petite outfits for those special and smart occasions. Their excellent range of petite outfits are not 'scaled down' but exclusively designed and made for the petite woman in sizes ranging from 6 to 18 for women 5’3” and under. Precis Petite gets our vote for the best shop for feminine petite contemporary tailored women's clothing with clean lines in top-quality fabrics. Precis Petite's website is a joy to browse with details on item length measurements on all their dresses, jackets, skirts and trousers. 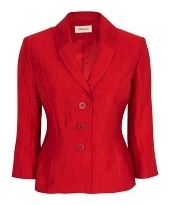 Precis Petite's current collections include feminine tailored jackets in wonderful colours such as the vibrant poppy red crinkle linen jacket pictured left and a matching shift dress or the complementary Secret Garden Shift Dress. 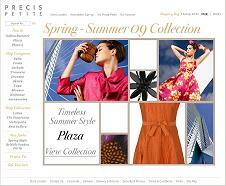 If you're looking for a petite wedding outfit have a look at Precis Petite Accessories. They have some fabulous fascinators which will add height without swamping you! Tailored crinkle linen jacket with a luxe sheen and ¾ length sleeve. Black palazzo leg trousers in 72cm or 75cm lengths. Sleeveless v-neck black and white marble print jersey dress. Beautiful cotton blend shrug with 3/4 sleeves in oyster. UK (excluding Channel Islands) and Eire (ROI) only. Delivery of in-stock items to the UK is within 3 working days, to Ireland 5 working days.